Author contributions: Monaco S, Mariotto S, Sansonno D and Dammacco F conceived and designed the manuscript; Ferrari S, Calabrese M, Zanusso G and Gajofatto A performed the literature review; all authors wrote and approved the final version of the manuscript. Supported by Ministero della Salute, Italy, No. RF-2011-02347955 to Monaco S.
Conflict-of-interest statement: The authors declare no conflict of interest. Since its identification in 1989, hepatitis C virus (HCV) has emerged as a worldwide health problem with roughly 185 million chronic infections, representing individuals at high risk of developing cirrhosis and liver cancer. In addition to being a frequent cause of morbidity and mortality due to liver disease, HCV has emerged as an important trigger of lymphoproliferative disorders, owing to its lymphotropism, and of a wide spectrum of extra-hepatic manifestations (HCV-EHMs) affecting different organ systems. The most frequently observed HCV-EHMs include mixed cryoglobulinemia and cryoglobulinemic vasculitis, B-cell non-Hodgkin’s lymphoma, nephropathies, thyreopathies, type 2 diabetes mellitus, cardiovascular diseases, and several neurological conditions. In addition, neuropsychiatric disorders and neurocognitive dysfunction are reported in nearly 50% of patients with chronic HCV infection, which are independent of the severity of liver disease or HCV replication rates. Fatigue, sleep disturbance, depression and reduced quality of life are commonly associated with neurocognitive alterations in patients with non-cirrhotic chronic HCV infection, regardless of the stage of liver fibrosis and the infecting genotype. These manifestations, which are the topic of this review, typically occur in the absence of structural brain damage or signal abnormalities on conventional brain magnetic resonance imaging (MRI), although metabolic and microstructural changes can be detected by in vivo proton magnetic resonance spectroscopy, perfusion-weighted and diffusion tensor MRI, and neurophysiological tests of cognitive processing. Several lines of evidence, including comparative and longitudinal neuropsychological assessments in patients achieving spontaneous or treatment-induced viral clearance, support a major pathogenic role for HCV in neuropsychiatric and neurocognitive disorders. Core tip: Neurocognitive dysfunction, sleep disturbance, depression, fatigue and reduced quality of life are common manifestations of chronic hepatitis C virus (HCV) infection. Neuropsychological performance is impaired in HCV patients, in the absence of structural brain alterations on conventional magnetic resonance imaging (MRI). Brain metabolic and microstructural changes are easily detected by in vivo proton magnetic resonance spectroscopy and perfusion-weighted/diffusion tensor MRI, enabling detection of brain dysfunction in clinically asymptomatic subjects. The regional distribution of metabolic changes indicates an exclusive involvement of telencephalic areas, but not the diencephalon or brainstem. HCV is likely to play a major pathogenic role in these disorders. Previously designated as non-A non-B hepatitis, the hepatitis C virus (HCV) was unequivocally recognized and established as a distinct virus after its isolation in 1989. In the following 26 years, HCV has been the subject of extensive research which has expanded our knowledge of the biomolecular and clinical features of HCV infection tremendously, and has paved the way for the introduction of newly synthesized, highly effective, direct-acting antiviral agents that are making eradication of the virus an achievable goal in nearly all chronically infected patients. Acute HCV infection is usually asymptomatic and able to resolve spontaneously in as high as 90% of cases, and thus remains undiagnosed in the majority of patients. Even so, progression to chronic infection occurs frequently. Thus, HCV represents a worldwide health problem considering that at least 3% of the world population, corresponding to roughly 185 million people, is chronically infected. However, infection rates are highly variable across different geographic areas. Of the six major HCV genotypes (gt), gt-1 is the most common worldwide, with subtype 1b being prevalent in Europe and subtype 1a in the United States. In intravenous drug users, gt-3a is more frequently detected in Europe and gt-2 in the Mediterranean area. Genotypes 5 and 6 are rare, whereas gt-4 occurs in over 20% of the infected Egyptians. Chronic HCV infection progresses to liver cirrhosis in 10% to 40% of the patients (this condition is the leading indication for liver transplantation) and liver cancer (i.e., hepatocellular carcinoma, HCC) in 1% to 5% per year. The annual mortality rate has been calculated to be roughly 4% of patients with cirrhosis and 30% of those with HCC. HCV-related neurological dysfunction is frequently observed either at cirrhotic or pre-cirrhotic stages. A major central nervous system (CNS) complication observed in patients with cirrhosis of differing aetiology, including those with HCV infection, is hepatic encephalopathy (HE), a potentially reversible neuropsychiatric syndrome, with symptoms ranging from clinically undetectable neuropsychological disturbances (minimal HE) to severe impairment of attention and arousal (overt HE). In addition, a large number of neurological complications occur in patients with chronic HCV infection independently of liver disease, including metabolic, inflammatory and autoimmune conditions affecting the CNS, as well as the peripheral nervous system and muscles[3,4]. HCV has been confirmed as both a hepatotropic and lymphotropic virus. Consequently, the liver is not the only target of HCV infection, so that several other organs and tissues are also likely to be involved. The term “HCV syndrome” was coined to include both hepatic and extra-hepatic manifestations of HCV infection[6,7]. One major extra-hepatic disorder associated with HCV is mixed cryoglobulinemia, which, in a minority of patients, results in clinically overt cryoglobulinemic vasculitis (CV). In agreement with the experience of other research groups, our data indicate that 90% or more of CV patients are in fact anti-HCV/HCV RNA positive. Figure 1 summarizes the major extra-hepatic manifestations that have been diagnosed, based on our own experience, in chronically infected HCV patients, with or without mixed cryoglobulinemia. As the figure illustrates, the most convincing associations of chronic HCV infection are with subsets of B-cell non-Hodgkin lymphoma (B-NHL), membranous or membrano-proliferative glomerulonephritis, IgM monoclonal gammopathy of undetermined significance (MGUS), peripheral neuropathy, and CNS disorders. Figure 1 Summary of major extra-hepatic manifestations observed in patients with chronic hepatitis C virus infection. 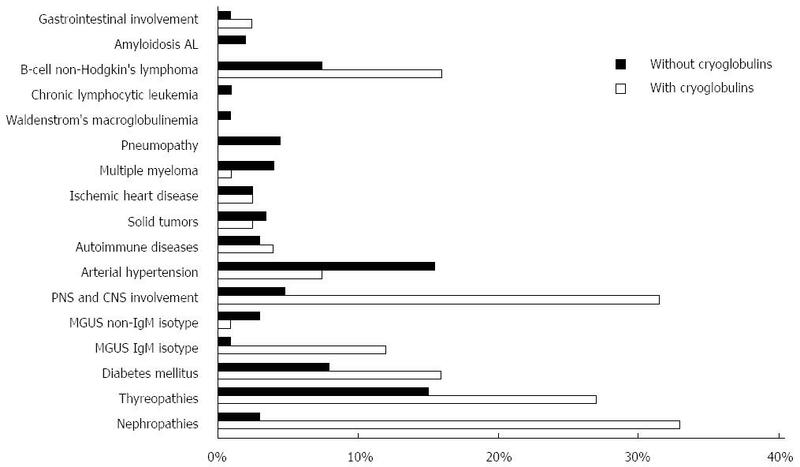 Percentages of patients are represented in graphic form. The presence or absence of cryoglobulinemia is indicated by white and black, respectively. The most convincing associations of chronic hepatitis C virus (HCV) infection are with subsets of B-cell non-Hodgkin lymphoma (B-NHL), membranous or membrano-proliferative glomerulonephritis, IgM monoclonal gammopathy of undetermined significance (MGUS), peripheral neuropathy, and central nervous system (CNS) disorders. The role played by HCV in the pathogenesis of the largely autoimmune and neoplastic diseases remains undefined, but a reasonable hypothesis is that HCV infection is an important component of a polyfactorial process in which multiple genetic and environmental cofactors are involved to a variable extent. The long-term observation of cohorts of HCV-positive patients indicates that many of them develop a complex and progressively more severe spectrum of HCV-related disorders, advancing from mild and often limited features, to systemic and more severe complications that may include HCC, B-NHL and possibly other neoplastic histotypes. Studies of the biology of HCV have been hampered by the fact that for many years chimpanzees were the only non-human in vivo models, and there was an unmet need for the development of in vitro experimental models. More recently though, researchers determined how to grow infectious HCV particles in cell cultures, which has resulted in a better understanding of the virus-host interactions enhancing virus propagation. Furthermore, small animal models permissive to HCV have been established, which now make it possible to investigate new antiviral agents and in the future, potential vaccine preparations. Recognized pathogenetic mechanisms in several HCV-related neurological disorders have in common an upregulated host immune response accompanied by production of autoantibodies, immune complexes, and cryoglobulins. However, alternative mechanisms have been proposed for the neurocognitive impairment and neuropsychological changes observed in HCV patients. The isolation of HCV RNA in microglial cells and astrocytes and evidence that brain endothelial cells are permissive for HCV entry and replication suggest an independent life and a pathogenic role of the virus in the brain. These findings are at variance with the detection of nonreplicative HCV RNA in epineurial macrophages, but not in the “endoneurial microglia”, of nerve biopsies of patients with HCV infection and peripheral neuropathy[13,14]. Although the clinical spectrum of HCV syndrome has been expanded, the exact pathophysiological mechanisms of cognitive impairment, neuropsychiatric disorders, and sleep disturbance remain poorly understood. Efforts to elucidate molecular pathways have provided results suggesting a pathogenic role for the virus itself, iatrogenic factors, and inflammatory cytokines in distinct neuropsychiatric conditions. Therefore, the detection of defective central serotoninergic and dopaminergic neurotransmission in some HCV patients with neuropsychiatric symptoms and mild or no liver disease has suggested a possible role for HCV in inducing dysfunction in selective aminergic systems. On the other hand, in patients under treatment with interferon (IFN), the occurrence of depression has been correlated with depletion of platelet serotonin, an effect also expected within the CNS, due to the effectiveness of antidepressant drugs that inhibit serotonin reuptake[16,17]. Other proposed mechanisms for dysfunction of the CNS and the neuroendocrine system include cytotoxic effects induced by cytokines released during systemic or brain immune activation[18,19]. Altered neuropsychological performance and neurocognitive impairment are frequently reported in patients with chronic HCV infection, often at stages characterized as having a lack of significant liver fibrosis and cirrhosis. These alterations typically occur independently of HCV genotype and in the absence of structural brain damage or signal abnormalities on conventional brain magnetic resonance imaging (MRI). Over the last few years, a number of factors, including associated comorbidities, alcohol misuse, substance abuse, interferon treatment, and HCV itself, have been investigated to assess their role as deteriorating or causative contributors to HCV-associated neurocognitive disorder (HCV-AND). Available data suggest that HCV-AND is unrelated to advanced liver disease, and therefore, the nature of this condition is distinct from the potentially reversible neuropsychological/neurophysiological complications observed in individuals with minimal HE, i.e., with biopsy-proven compensated cirrhosis or portal-systemic encephalopathy. Unravelling the contribution of different factors to cognitive dysfunction and elucidating the pathogenic role of HCV represent issues of major importance for making personalized treatment options available. Emerging lines of evidence suggest that the profile of neuropsychological dysfunction in HCV-infected patients is characterized by impairment in executive function, sustained attention, working memory, verbal learning and verbal recall. Conversely, the neuropsychological complex observed in minimal HE includes impairment in psychomotor speed, selective attention, visuoconstructive function and executive function. Forton et al, using in vivo proton magnetic resonance spectroscopy (1H MRS), first reported elevated choline/creatine ratios in basal ganglia and frontal white matter (WM) of HCV-infected patients with mild liver disease, but not in patients with hepatitis B virus (HBV) infection. Subsequently, these alterations were correlated with impaired concentration and working memory in a group of patients with active viral replication, whereas the cognitive performance of patients who had achieved HCV clearance was equivalent to that of controls. Intriguingly, metabolic changes detected by 1H MRS in HCV patients were different from abnormalities previously associated with minimal HE, which were characterized by reduced choline/creatine ratios. The occurrence of significant deficits in executive function and attention, with worse performance in patients complaining of fatigue, has been reported in HCV patients with normal liver function. This neuropsychological profile was correlated with a decrease in N-acetylaspartate (NAA)/creatine ratios in the cerebral cortex. Conversely, only slight attention deficit and impairment of verbal learning were documented in a study involving 37 HCV patients without significant liver disease or other relevant comorbidities. In these individuals, 1H MRS revealed increases in choline and decreases in NAA in the centrum semiovale, as well as increases in creatine, a marker of astrocytic gliosis and microglia activation, in basal ganglia. Increased levels of creatine were also detected in the basal ganglia of HCV patients with impaired attention and working memory in another study; unexpectedly, increased concentrations of NAA plus N-acetyl-aspartyl-glutamate, possible markers of on-going repair and neuroprotective mechanisms, were also found in these patients. More recently, decreases in NAA/creatine ratios in the fronto-parietal WM, in the absence of other metabolic changes, were found in 15 patients with mild liver disease, diminished visual concentration endurance and unaffected executive function. These alterations were coupled with increased perfusion of basal ganglia and reduced perfusion of left frontal cortex, bilateral temporoparietal cortices, and posterior cingulate gyrus. Furthermore, increased myoinositol in bilateral frontal WM and decreased levels of NAA in parietal WM without changes in basal ganglia were documented in a cohort of HCV treatment-naïve patients with reduced psychomotor speed and verbal fluency. These patients also showed microstructural brain pathology in the striatum, external capsule, and fronto-occipital fasciculus by diffusion tensor MRI. Taken together, the variability observed across different studies likely reflects the use of different psychometric scales and heterogeneity among recruited patients. Results of studies addressing the quantification of brain metabolite concentrations in HCV patients with neuropsychological and neurocognitive dysfunction are shown in Figure 2. Despite a number of limitations, these studies demonstrate that chronic HCV infection is associated with significant brain metabolic alterations as a result of activation and proliferation of glial cells (including astrocytes, microglia, and monocyte/macrophages) and increased turnover of myelin membranes. The regional distribution of 1H MRS abnormalities suggests that only cortical and subcortical telencephalic areas, but not the thalamus or posterior fossa structures, are involved in HCV-AND. These findings are in agreement with results of neuropathological studies in human immunodeficiency virus (HIV)-HCV co-infected individuals, demonstrating the presence of HCV RNA in the frontal cortex, basal ganglia, and subcortical white matter, but not in the thalamus, cerebellum, and brainstem. In addition, HCV NS5A and NS3 proteins, as well as the core antigen, were found in astrocytes and macrophage/microglial cells. These findings are relevant, in view of the evidence that the core protein may trigger and support a neurodegenerative cascade through the activation of ERK/STAT3 pathway. Studies using ligands that bind serotonin and dopamine transporters have revealed a decreased density of serotonin and dopamine nerve terminals on single-photon-emission computed tomography in HCV patients with neuropsychiatric disorders and cognitive impairment, even in the absence of significant liver disease. Moreover, images obtained through positron-emission tomography with the use of fluorodeoxyglucose revealed decreased glucose metabolism in limbic, frontal, parietal and temporal cortices[15,31,32]. Earlier studies, employing neurophysiological tests of cognitive processing, revealed delayed peak latencies and reduced amplitudes of P300 in HCV patients compared to healthy subjects, thus providing a potential and sensitive neurophysiological measure of subclinical cognitive impairment. Figure 2 Quantification and localization of brain metabolite concentrations in hepatitis C virus patients exhibiting neuropsychological and neurocognitive dysfunction. The regional distribution of proton magnetic resonance spectroscopy (1H MRS) abnormalities suggests that only cortical and subcortical telencephalic areas, but not the thalamus or posterior fossa structures, are involved in hepatitis C virus (HCV)-associated neurocognitive disorder (HCV-AND). The characterization of neuropsychological/cognitive dysfunction in HCV patients has been the subject of several studies. Defects in verbal recall and working memory were found in one-third of HCV patients, including individuals with advanced liver fibrosis, cirrhosis, and a history of alcohol misuse and/or intravenous drug abuse. In contrast to earlier reports, cognitive performance was not affected by the degree of fibrosis. Impairment of verbal learning and memory was detected in a cohort of HCV and HBV patients, including patients with cirrhosis, as compared to healthy controls, whereas verbal learning, auditory attention, and reasoning/mental flexibility were affected in a cohort of 24 non-cirrhotic HCV patients with a negative history for medical/psychiatric comorbidities, and drug and/or alcohol abuse. More recently, the study of a small and well-selected cohort of homogeneous state-infected, treatment-naïve patients with mild liver involvement and a similar history of iatrogenic HCV exposure, showed that half of HCV RNA-positive patients had alterations in memory, sustained attention, and delayed auditory recognition, as compared to HCV RNA-negative subjects who had spontaneous viral clearance. The effect of successful anti-HCV treatment on neurocognitive measures was recently investigated in a longitudinal multicentre study involving a relatively large number of HCV patients, 15% of whom had cirrhosis. Long-term evaluation at 12 mo or more following treatment showed a significant improvement in vigilance and working memory in patients who had achieved sustained virological response (SVR), but not in non-responders. Sexual dysfunction, emotional distress and psychiatric disturbances are frequently described in HCV-infected patients. People with HCV infection have a higher risk for depression, anxiety, somatization, compulsiveness, insecurity, aggression/hostility, phobic anxiety, and psychosis. Although major psychiatric co-morbidities, concomitant or previous substance abuse, and the psychological consequences of having a chronic life-threatening illness may account for most of these manifestations, several studies have indicated a primary role for HCV. Based on DSM-IV criteria, 28% of chronically HCV-infected individuals experience depression, which makes it difficult for them to adhere to therapy[40,41]. Major depressive disorder and recurrent brief episodes of depression unrelated to interferon treatment have been reported. Nevertheless, the prevalence of psychiatric symptoms is probably underestimated in routine clinical examination, even though psychiatric screening, accurate diagnosis, and confirmatory evaluation by validated measures are strictly required. Depression, anxiety and fatigue are among the most common adverse events in IFN/ribavirin treatment, and their cumulative incidence seems to increase during IFN treatment, but returns to baseline values following completion of therapy. No major risk factors for treatment-induced psychiatric symptoms have been identified as of yet. While the presence of depression at baseline can be predictive of increased psychiatric burden and early treatment discontinuation, no apparent impact on the achievement of SVR in patients completing treatment has been reported[48,49]. Failure to clear HCV-RNA has however been associated with IFN-induced depression[44,50], and in these cases, serotonin-norepinephrine reuptake inhibitors, bupropion and modafinil, may improve affective and neurovegetative symptoms of depression. The efficacy of pre-emptive antidepressant therapy has been questioned in some studies, with the exception of patients with pre-existing subclinical depressive mood, mild cognitive disturbances, sadness, and reduced sleep. In addition to depression, HCV is associated with social marginalization, impairment of intimate and family relationships, reduced sense of well-being, anger, inappropriate coping strategies, and stigma. The pathogenesis of HCV-related neuropsychiatric symptoms is poorly understood and it still remains to be determined whether the occurrence of depression is a risk factor or a consequence of the infection. While psychological and social factors are of primary importance, the evidence that depression is less frequently observed in HBV-infected patients treated with IFN compared to those with HCV infection suggests a relevant role of the virus itself in the development of neuropsychiatric symptoms. Central or cognitive fatigue is a subjective lack of energy remaining after rest, which is perceived as a sensation of physical and mental exhaustion, and is accompanied by a lack of motivation and difficulty in initiating and completing wilful actions. Severe fatigue is frequently associated with impaired cognitive function, with defects in concentration, attention tasks, and memory on neuropsychological testing. Irrespective of the severity of liver disease or viral replication rate, between 53% and 80% of HCV-infected patients complain of fatigue, often in conjunction with joint pain, restless leg syndrome, mood alterations, and headache. Intriguingly, fatigue is worse in HCV-infected patients than in patients with comparable liver dysfunction of other aetiologies[56,57], and improves after antiviral treatment in the majority of patients. However, persistence of fatigue is observed in roughly one third of patients despite the decrease in viral load. The association between HCV infection and fatigue has been questioned in earlier studies comparing HCV-infected patients with healthy blood donors, and also in studies reporting the lack of a prevalence of HCV infection among patients with chronic fatigue syndrome[60,61]. However, the latter condition, which differs from chronic fatigue, is a clinically defined complex disorder coupling disabling fatigue with neuropsychiatric symptoms, sore throat, muscle or joint pain, cervical or axillary lymphadenopathy, sleep disturbance, headache, and post-exertional exacerbation of malaise. In a cross-sectional observational study, 130 HCV-infected patients, 34% with cirrhosis, and 61 healthy controls completed a questionnaire to assess health-related quality of life (HRQL); 95 HCV patients also completed a fatigue questionnaire. Chronic fatigue (defined as fatigue persisting for ≥ 6 mo) and chronic fatigue syndrome occurred in 71% and 27%, respectively, of HCV patients compared to 25% and 11% in the control population. Nevertheless, while more HCV patients reported chronic fatigue, the severity of fatigue experienced was similar between the two populations. Establishing the causes of fatigue in patients with chronic HCV infection is difficult, although comorbid neuropsychiatric symptoms, liver fibrosis, and HCV neuroinvasion have been considered in several studies. However, while severe fatigue is generally an indication for antiviral treatment, “iatrogenic fatigue” is commonly encountered during interferon therapy, often leading to premature interruption of the treatment. A recent study addressed the effect of pegylated-INF/ribavirin treatment on fatigue in a cohort of patients with chronic HCV infection. At 24 wk after completion of treatment, the proportion of patients experiencing fatigue shifted from a baseline value of 53% to 33% in the group achieving SVR, with a median decrease at the visual analogue scale from 27 mm to 13 mm. Conversely, a non-significant decrease for the presence and the severity of fatigue was observed among non-responders. Sleep has been defined as a behaviour which can be measured according to five dimensions, including duration, efficiency, timing, alertness, and satisfaction. The assessment of the aforementioned dimensions represents a valuable indicator of sleep health. Sleep disturbance has a negative impact on innate immunity, impairs the response to infectious agent and vaccines, and is associated with increased susceptibility to acute infections and severity of symptoms. In addition, the reported higher prevalence of altered sleep patterns in patients with acute and chronic infections, often occurring in conjunction with pain and fatigue in the setting of the so-called “sickness behaviour”, reinforces the notion that the talk between the immune system and the brain is of great importance in regulating sleep architecture and other aspects of this behaviour. Sleep disturbance with disordered circadian rhythm and reversal of day and night cycle has been frequently reported in patients with overt HE. In addition, abnormal sleep patterns have been detected in 50% of cirrhotic patients with minimal HE, as well as in those with non-cirrhotic chronic liver disease. To date, little attention has been devoted to sleep disturbance in chronic HCV-infected patients in spite of the frequent occurrence of complaints in sleep satisfaction/quality, a subjective judgement of sleep as good or poor. In a recent study, self-report sleep scales assessing quality, latency, duration, efficiency, and daytime dysfunction, in addition to sleep diaries and wrist actigraphy (as a measure of nocturnal activity and sleep-wake patterns), were combined to examine a cohort of non-cirrhotic HCV patients with mild hepatic disease. Not surprisingly, HCV-infected patients were dissatisfied with sleep quality, and exhibited altered sleep patterns, increased nocturnal activity, and poorer sleep efficiency, regardless of their individual viremic state. However, no alterations in the 24-h physical activity level were observed, and no correlation was found between fatigue and nocturnal activity. These findings are in contrast to the sleep disturbance observed in cirrhotic patients, which is characterized by fragmentation of sleep and reduced 24-h activity. In addition, for delayed sleep phase syndrome, pronounced daytime sleepiness and frequent awakenings were observed in patients with minimal HE. Taken together, among extra-hepatic manifestations of chronic HCV infection, sleep disruption entails a significant burden, and negatively impacts mood alterations, quality of life, and possibly fatigue. Further research is needed to clarify the pathophysiological mechanisms responsible for alterations in the circadian clock. Quality of life can be defined as overall satisfaction with life, referring to wellbeing within the functional domain assessment of physical and mental health and social functioning. Chronic medical conditions are typically associated with a reduced quality of life as reported by patients, although measurement tools of such aspects have obvious limitations. Existing self-reporting questionnaires generate different scores according to different categories, such as general and mental health, social and physical functioning, pain, vitality, and impact of the disease. There are no quality of life assessment scales specifically developed for HCV-infected subjects. SF-36 or its short version (SF-12) are typically used, since these methods have largely demonstrated high accuracy in detecting quality of life impairment in a wide range of chronic diseases. More than half of patients with chronic HCV infection complain of fatigue, lassitude, impaired concentration and memory, which are known to interfere negatively with quality of life at least as much as physical symptoms. Patients also report a reduced quality of life, which is frequently independent of the severity of liver involvement or virus replication rate. Fatigue, cognitive dysfunction and mood alterations have a profound effect on social and physical functioning, thus further impacting HRQL. Lower quality of life scores have been described in HCV subjects compared to HBV-infected patients and healthy controls. Interestingly, these findings seem not to be exclusively related to the psychological effect of HCV positive status awareness, since patients who are unaware of the infection perform better than patients who know their HCV status but worse than healthy individuals. More recent studies that assessed HRQL using the SF-12 questionnaire in German HCV/HBV positive patients and healthy controls, confirmed a predominant impairment on both mental and physical quality of life in HCV subjects despite a more evident liver disease in HBV ones[73-75]. Whether these data reflect direct viral damage or are a consequence of chronic inflammation is still unclear, but viral infection itself is an important factor contributing to reduced HRQL. SVR has been associated with an improvement in HRQL scores that can be due to both viral status and patient perception. Using the SF-36 scale, a comparison between HCV infected patients and healthy subjects revealed a lower HRQL at baseline, but a marked improvement was noted in patients responsive to IFN/antiviral treatment. However, IFN treatment may also be associated with reduced quality of life, in particular during the initial phase of therapy, which is likely to be due to potential side effects of IFN injections both at physical and emotional levels. The combination of IFN and ribavirin no longer represents the therapeutic standard of care, at least for difficult-to-cure HCV-infected patients of gt-1 and gt-4. The introduction of telaprevir and boceprevir has resulted in a higher rate of SVR, but these antiviral agents are being rapidly replaced by the new interferon-free, all-oral regimens that include direct-acting antivirals such as sofosbuvir, daclatasvir, and simeprevir, with or without ribavirin. In spite of the high costs that currently prevent their accessibility to all patients who may benefit from treatment, several of these regimens are under intensive clinical investigation and have been able to induce SVR in 90% or more of the patients, even in those with HCV re-infection and accelerated progression following liver transplant. A careful assessment of the most appropriate therapeutic regimen for each specific clinical situation will require further multicentre trials. Additional points that need to be addressed include the identification of novel predictive factors, the adoption of new criteria to define the length of therapy, and the elucidation of resistance mechanisms that may result in the emergence of drug-resistant viral variants. Finally, the most eagerly awaited goal is the development of a safe and effective vaccine.